I returned to this Battersea rooftop project after 15 years to enjoy immersive sunshine in the company of new owners. 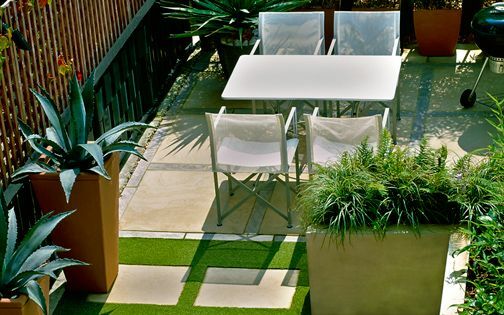 Hailing from Italy, the clients adore the Mediterranean roof terrace we created here, and while the overall design remains intact, its flora has matured, forming graceful silhouettes. 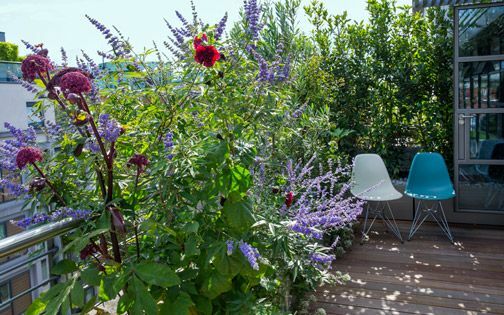 There are fresh additions, where the new owners' enthusiasm for growing fruit, vegetables and herbs enriches the roof terrace with culinary piquancy. The Jelly palm is fruiting wholesomely within feathery contours, framing a Battersea Power Station vista, and I was just in time for the Olive harvest – soaking up precious sunrays amid the scents and sounds of Oleander, Pine and Palm trees. Pinus halepensis, the Aleppo pine, native to the Mediterranean region, is at home here in the warmth of a first-floor, south-facing rooftop. With its evergreen architectural outline, the Pine infuses maritime essence, producing an easy to cultivate, precious privacy screen. Augmented by variegated Yuccas, this corner is elevated with dainty textures and vibrant colour added by the new client, wholly energising the rooftop terrace. 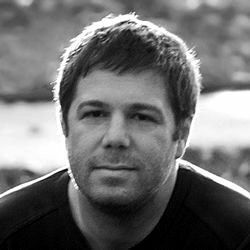 Born and raised in the Mediterranean myself, I love to include piny textures when suitable, where such indispensable species evoke coastal and mountainous landscapes, and form thriving, coniferous Mediterranean essence. 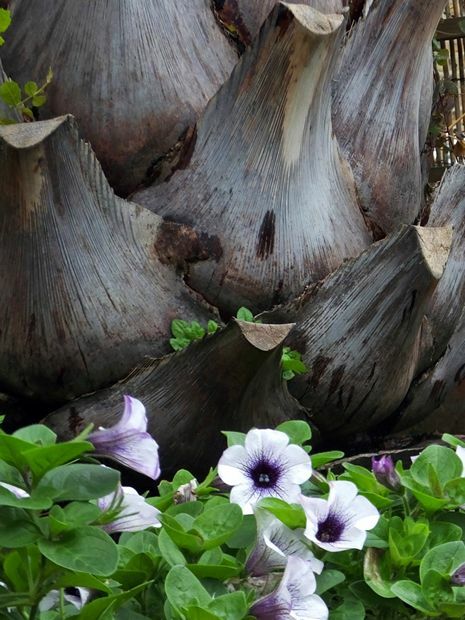 Although South American, Butia capitata, the Jelly palm, presents a graceful feathery outline like no other winter-hardy Palm, and we often plant this majestic architectural tree in the shelter of balmy courtyard gardens. 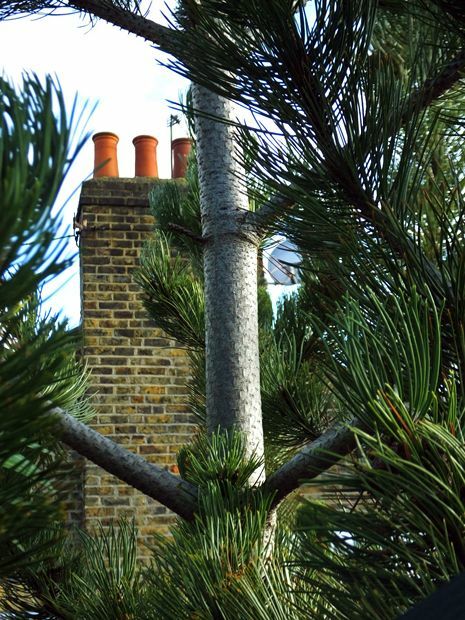 Reaching 6-metre height in warm climates, here in Battersea, the Butia is slow-growing, steadily filling the skyline with sought-after Mediterranean nuances; featured in a built-in raised bed, its sculptural silhouette anchors the unusual vertex of this intriguing, triangular rooftop terrace. Having matured sublimely in a sweltering, well-drained environment and plenty of sunshine, the tree generates a distinct focal point, where its canopy defines the seating area effortlessly, spread above a remarkably sculpted trunk. 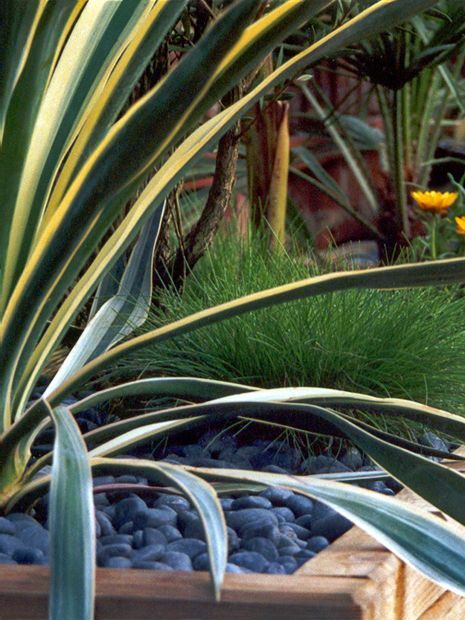 The variegated Spanish dagger is a vibrant Arizona yucca cultivar; with its vivid foliage, this resilient, sculptural shrub slowly increases in scale, enabling a softer interplay of textures among it. We plant and forget it, letting it do its own thing, where it requires minimal upkeep except removing withered leaves. Yucca gloriosa ‘Variegata’ flowers rather freely, producing tall spires of white inflorescences – enriching this Mediterranean rooftop tapestry all year round. To minimise glare amid direct sunlight across the roof terrace, we detailed a trio of materials adaptable to this very task. 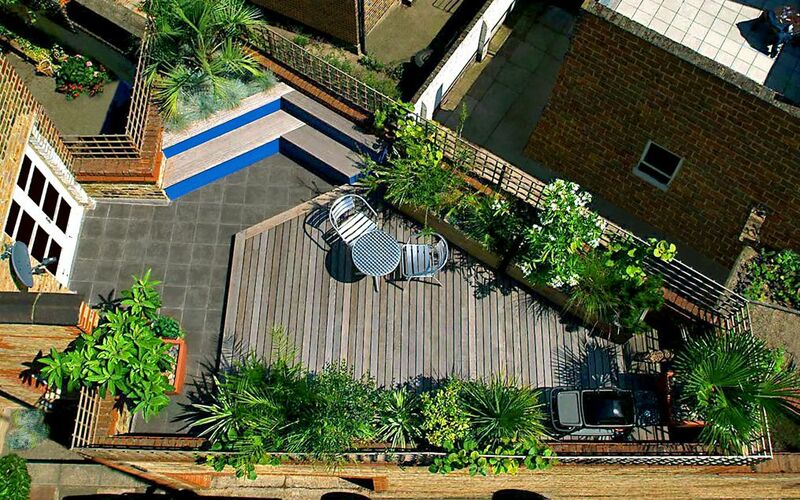 A Cedar deck, Iroko bench and slate-grey tiles define minimalist terrace patterns under lush Mediterranean canopies. The wood's bullnose finish and natural tile edges form an ergonomic, cosy surface palette. The detail design articulates a sequence which weathers gracefully in the heat of the sun, sustaining thermal expansion generated by the brick and timber structure of a parking space below the rooftop. 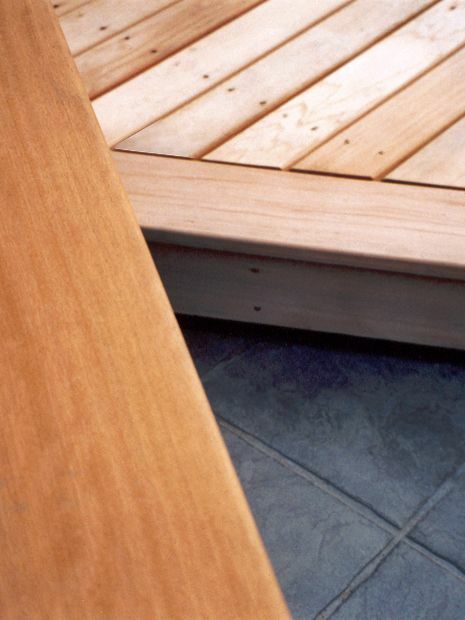 Our 4-metre built-in bench fits snugly at the terrace's southernmost vantage point. Crafted in solid Iroko hardwood, this cosy seat forms a spacious social hub, enveloped by a Jelly palm, Blue fescue grasses and Kiwi fruit climbers, and while integrated into a spacious raised bed, there's ample space to perch and rest refreshments along its upper shelf. Coated in a soothing azure blue, the custom-made seat glistens in the afternoon sunbeams, defining a greater sense of space, and infusing inviting Mediterranean charm. 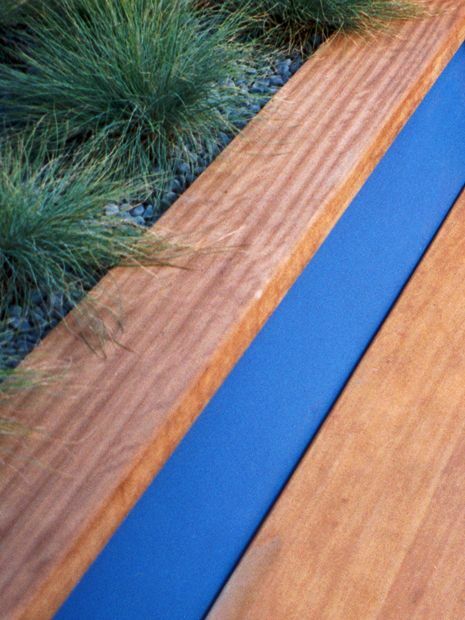 A Mediterranean colour palette forms a vibrant spectrum, enhancing a roof garden design within a warm microclimate. 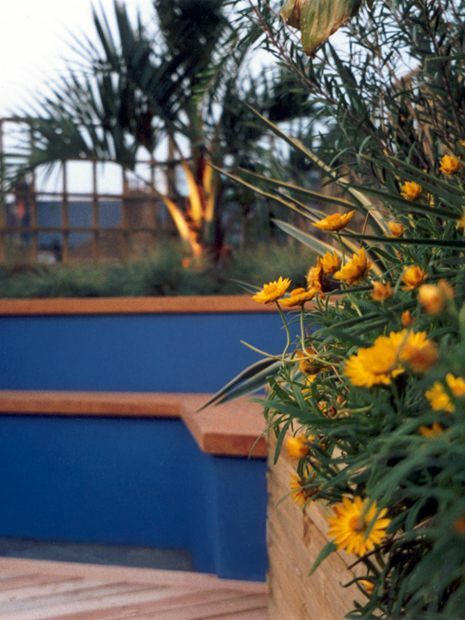 In this Battersea rooftop, blue and ochre tones merge seamlessly to form harmonious compositions, and produce organic contrast conducive to the terrace's daylight qualities. The wood's warmth and surface afterglow, enfolded by Daisies, Lavenders and Olive trees, evoke the intimacy, energy and freedom we often seek in our Mediterranean holiday destinations. 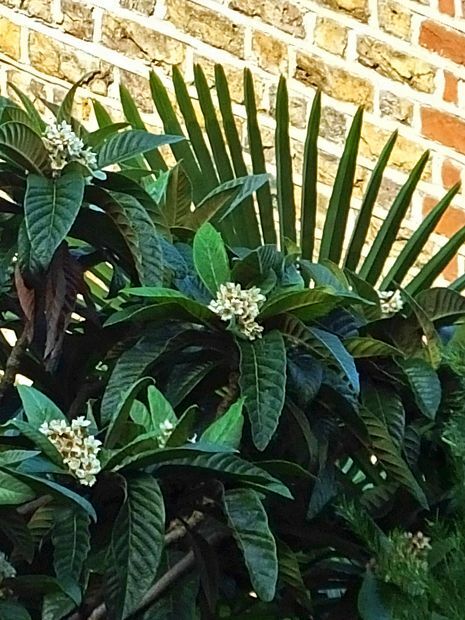 Eriobotrya japonica, the Loquat tree from China, is a staple of many Mediterranean planting schemes. Personally, this small evergreen tree evokes childhood memories, epitomising spring, when its ripe fruit is ready to be picked – savoured fresh or utilised in luscious compotes. In London, this species develops slowly into a large shrub, producing tangy delectability in hot balmy summers. 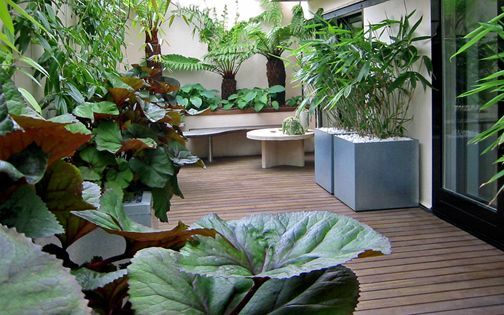 The glossy arching foliage surpasses 40cm in optimal conditions, adding valuable shade, while enabling daintier flora to thrive in architectural rooftop designs. 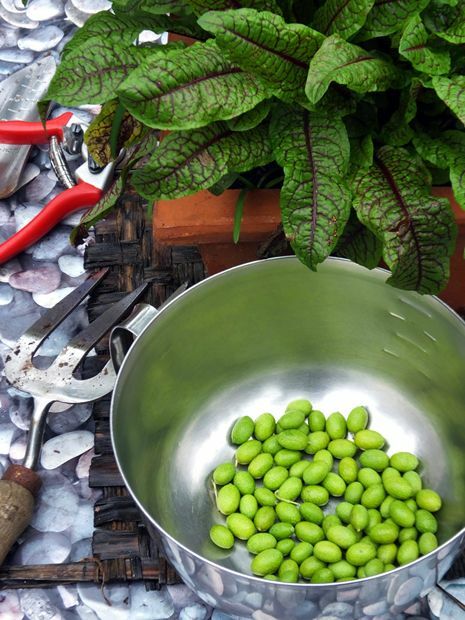 With 15 years of soaking up rooftop sunshine, our Olive tree is maturing just beautifully, producing a fruity crop. 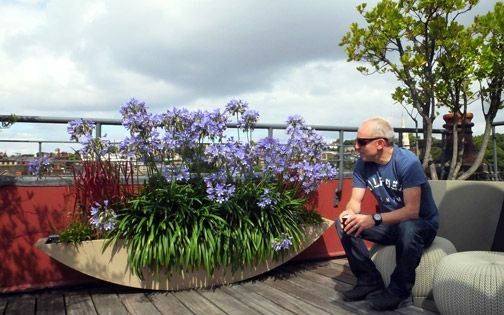 The new owners maintain the roof terrace well, enjoying the established spectrum of Mediterranean tree specimens. Ample drainage and an automatic irrigation sustain healthy plant growth throughout this allegorical maritime landscape – capably shoring up an efficient roofscape. 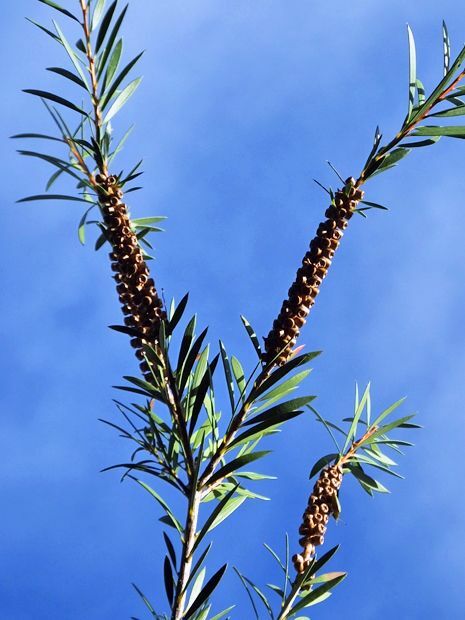 As Bottlebrush flowers encapsulate their dried seed heads under blue Battersea skies, terra firma merges with a metaphoric coastal landscape. While the rooftop is built above the ground level parking, amid a low-rise urban streetscape, the expanse of its cerulean canopy becomes even more distinct on a clear day. 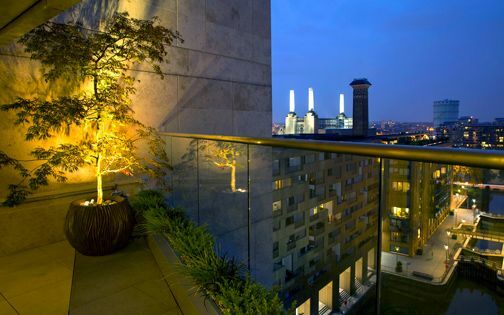 Having designed and built many Chelsea and Pimlico roof garden terraces overlooking Battersea Power Station, perched at great heights, this outdoor space forms an intimate retreat in proximity to an enchanting London landmark. Both our original client and the new owners share a passion for this outdoor space and a zest for all things Mediterranean. I returned to provide some advice, and sample the myriad of invigorating textures – chuffed to see the terrace is thoroughly and frequently relished. Our joint perspective is narrating an enjoyable afternoon rooftop session, exchanging fresh roof terrace ideas and concepts, where my hosts' nonchalant qualities and witty anecdotes perfectly suit this private rooftop – abundant in fruit, foliage and a laid-back terrace lifestyle. Similarly to Bluebells in UK's spring Beech woodlands, the Cyclamens of the Mediterranean form radiant pink carpets across evergreen Pine forests in winter. Such seasonal renewal is emblematic of the energy we seek in our own back gardens and roof terraces. 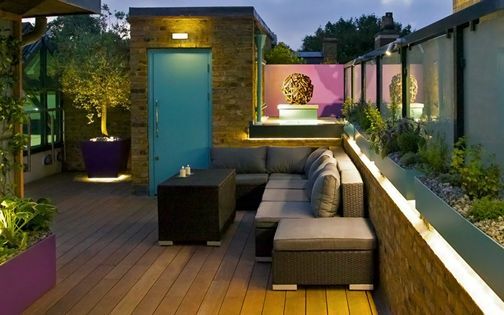 In London, each season is highlighted in the rebirth of well-designed, landscaped roof terraces, and when new owners derive enjoyment and fulfilment from our settings, the connective verdant environments we create within this lofty, urban journey are truly defined.